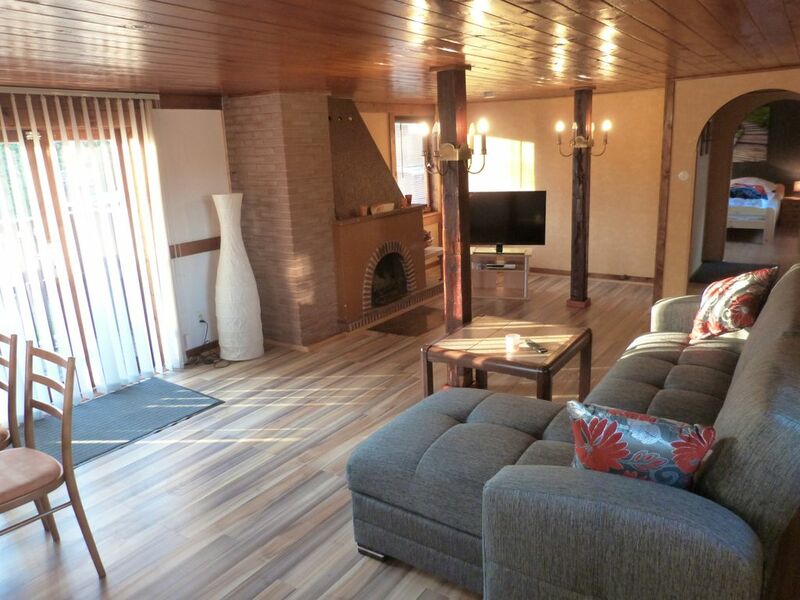 Our cozy apartment "Heaven's Gate" is quiet and located separately in the upper part Hasserode. The apartment is close to the edge of the forest (Heaven's Gate) and is thus the starting point for many hiking and biking trails. The historic city center with its many attractions (castle, market square with town hall, etc.) is only about 1.5 km away. A bus stop, train station HSB / Brockenbahn, supermarket and a bakery can be reached in just a few minutes walk. The famous health resort Schierke is only 20 min. away by car. A fun pool with spa and bowling alley is in 5 min. to reach by car, as well as a cinema and various restaurants. Brochures and timetables are available for you in the apartment. For more information and advice please contact your disposal. Parking is available at the roadside about 25 meters from the property. For one-and unloading you are welcome to take our land. On the balcony seating is available and in the outdoor area there is a lawn with barbecue, table, chairs and parasol. An outside staircase takes you to the apartment on the 1st floor. ATTENTION: The room height of the apartment is about 2 meters !!! Included in the rental price are towels, bed linen, tea towels, kitchen rolls, toilet paper, coffee filters, hygiene covers on mattresses. Please also discuss appointment and arrival and departure times by telephone. A travel cot and high chair can be provided on request free of charge. Its rate is according to the statute 2,50 € per person per day! For this you can use public transport for free and still have a few other perks. The Payment You may pay by bank transfer or cash. Convenient, good for the price. Host very accomidating. The apartment is not large but convenient and comfortable. If you like to make some of your own food and not eat out so much it is perfect. It is small, but very conveniently located. The parking was down the street, but that was OK. The ceiling is a little low, but if you are not over 6'2" it is not a problem. The apartment is very nice. If you are more than a couple, there is a foldout bed is with slats and not springs so it was great for my back. The kitchen is a corner of the living room. Two hot plates, plenty of cooking pans etc. Dishes of various types for three. So if you are a couple or three persons this is a perfect place to stay. We went there to ride the HSB RR in the winter and we had great fun. The location is perfect for seeing Werningerode and the surrounding area. I can very much recommend this place, especially in leu of the the hotels which are somewhat pricy. I would stay here again and recommend it highly. We enjoyed staying in Wernigerode which we found lovely. The flat was fine and convenient for the town, but we found the kitchen rather small, especially having the kettle, toaster and coffee machine on the fridge. Also the garden area would not really be usable , as far as we were concerned. The decor and the furniture were great and overall we had a good time. The owner was very helpful and friendly and we were relaxed. Apartment was as described, clean, welcoming, quiet, convenient. Location is amazing, about a 20 minute walk to the town center or faster on a bike. We didn’t notice the 11 Am check-out time and asked if we could check out later. Owners we’re supremely understanding and helpful throughout. Highly recommend!! Lovely property but would have been nice to be greeted by the owner who we never met. Only negatives were: *the house shown in the pictures is not were you stay, the accommodation is out the back over the garage. * the celing height is low, anyone over 5'6 will struggle having a shower. * only received the discount booklet which is part of the tourist tax on evening 4 of our 5 day trip so missed out on discounts and free bus travel. * it's further away than we thought, 20 mins walk to the edge of town and 35 to the station. Positives: were we had a lovely time, you can hear the steam trains at the accomodation. Must do's are the trip up to the brocken and the castle. Super Preis Leistung. Nur zu empfehlen! Super Lage, nette Vermieter, für einen kurzurlaub gut ausgestattet. Kleine süße Ferienwohnung. Sauber, sehr ruhig und mit allem Nötigen ausgestattet. The apartment "Heaven's Gate" is located in the upper Hasserode in Wernigerode, close to the edge of the forest and yet centrally located.